From a single ultrasonic tank to a multistage automatic line and for applications ranging from maintenance to precision cleaning in production environments. The modular Finnsonic Versa genius Range offers a small footprint system that can grow with your requirements. FinnSonic ultrasonic cleaning tanks provide a precise and pervasive cleaning effect featuring Ultrasonic Boost, Sweep and Degas technologies as standard. The unique Booster function provides extra power for challenging contamination, whereby the Frequency sweep eliminates dead spots and ensures a uniform washing result. * Transducers bonded to tank base. Side transducer versions available. Centrifugal pump Grundfos CM 3-4, 0,5 kW, Seal AQQE. Centrifugal pump Grundfos CM 10-2, 1,2 kW, Seal AQQE. Centrifugal pump Grundfos CM 15-2, 2,2 kW, Seal AQQE. Centrifugal pump Grundfos CM 3-4, 0,5 kW, Seal AQQK. Centrifugal pump Grundfos CM 10-2, 1,2 kW, Seal AQQK. Centrifugal pump Grundfos CM 15-2, 2,2 kW, Seal AQQK. Internal dimension “height” is the distance from bottom of the basket to the liquid surface when tank filled up to the overflow weir. Compatible with manual and automatic operation. Handles on the long sides. Advances in technological development set ever higher requirements for component cleanliness in today’s manufacturing industries. FinnSonic Versa Genius represents the 3rd generation of our popular Versa range. It boasts many new thoughtful details as well as innovative FinnSonic Genius ultrasonic technology. FinnSonic Versa Genius offers a perfect match with your requirements for cleanliness, productivity and EHS (environmental, health and safety) aspects. 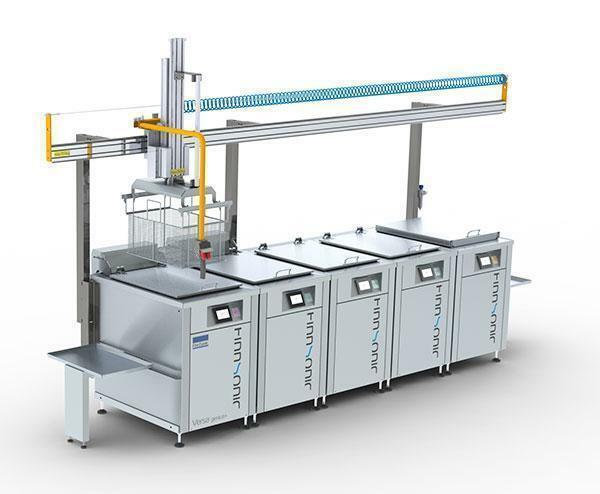 FinnSonic Versa Genius cleaning line is configured out of washing, rinsing and drying modules and their options. Scope can range from single manually operated unit to a fully automatic multi stage line. The basic module is a treatment tank. Versa Genius sets new standards for the module design. Thoughtful details in fluid connections, agitation and control features give you a more functional, flexible and energy efficient process. FinnSonic Genius ultrasonic technology - automatic adaptation of generator parametres, constant maximum performance.